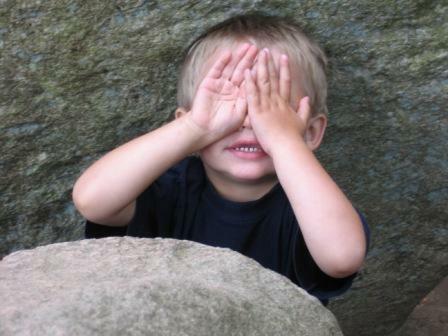 When my boys were young we played a game that they affectionately called “hiding”, at the end of bath time. They would climb out of the tub and I would throw a towel over them as they lay on the floor tucked in and head down. The fun would begin when, I would start by saying, “Where’s Logan? Where did he go? Is he in the bathtub? No, he’s not there! I wonder where he could be?” I would put my hands on his back as I leaned into the bathtub to see if he was there. And inevitably there would be a giggle from under the towel. I would go on to look under the sink, behind the toilet, in back of the shower curtain, all the while my precious little one would lay on the rug “hiding”. Finally, he would get tired and say, “Mommy, I’m right here!” And he’d jump up from under the towel. They all loved that game and we played it endlessly. It always amazed me why they enjoyed that game so much. It was so simple and in my adult eyes completely ridiculous. I often wondered how they could believe that they were really hiding from me. As I was reminiscing recently about this game I played with my kids so long ago, I felt God’s whisper, “Hmmm, don’t you play this game with me?” Ouch. Why do I think I can hide? I KNOW that He is the God of the Universe, that He sees me and knows me intimately and most of the time that brings me great joy. Until . . . I don’t want Him to know what I’ve done, what thoughts I’ve had, what words I’ve spoken. And then I play the hiding game! I curl up in the fetal position with my shame and embarrassment over my head and just like my children, pretend He doesn’t see me, He doesn’t know what I’ve done or what I’ve thought. I’m not the only one who has tried to hide – Adam and Eve hid after they disobeyed God in the Garden, David when he tried to cover up what he did with Bathsheba and Jonah who jumped on a ship and went in completely the opposite direction. (At least I’m in good company!) The Bible is filled with men and women who tried to hide from God, to cover up what they had done, to run from what He was calling them to do. It’s silly to think that we can hide from God. But what I find amazing is that even when I’m running from God He is THERE! And He loves me with an Everlasting Love. His great desire is to bring me back into fellowship with Him. He stands with arms wide open ready for me to step back into His embrace! So let go of the shame and embarrassment or that one thing that is holding you back from His embrace and RUN, RUN, RUN into His arms, He’s patiently waiting. ← That Scary Word Called . . . There must be something about bath time that calls for fun! Your message goes hand in hand with the one Karlene wrote today. Maybe God is trying to tell me something. If you're wondering who Karlene is and what she wrote. Check out Jewels of Encouragement.